Check out all my adventures in college. 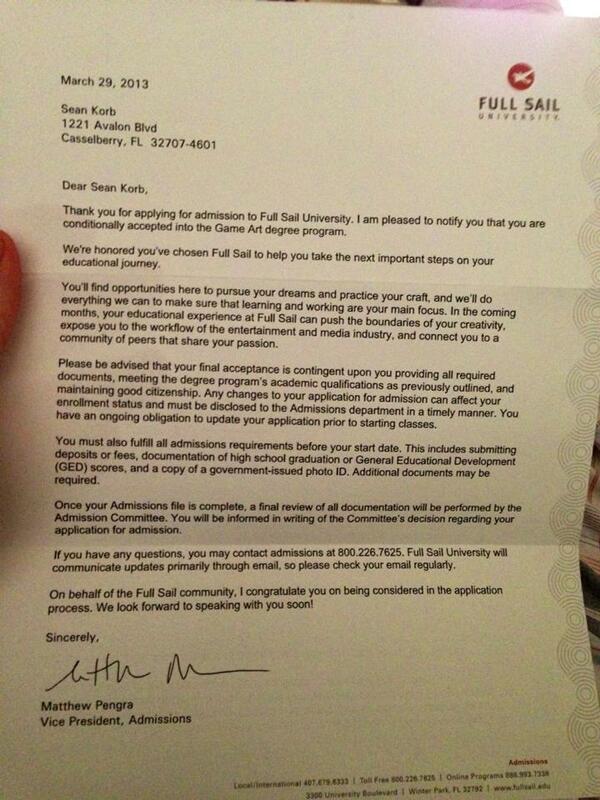 So excited to have received my Letter of Acceptance into Full Sail today. I have been working hard on getting all the paper work completed and looking forward to it being finished so I can get started. There is a LOT of paper work that must be filled out online through the Launch Website. I have completed it all, now just waiting on the last 3 items to be approved. Ball is picking up momentum! Posted on March 29, 2013, in News and Info and tagged Bachelors Degree, College, Full Sail, Letter of Acceptance, Sean Korb, University, Video Game Art. Bookmark the permalink. Leave a comment. Enter your email address to follow my blog and receive notifications of new posts by email. See how I am progressing and get up to the minute details of my adventures at Full Sail University.